In her second term as the United States Poet Laureate, Tracy Smith continues to travel the country in her mission to bring poetry to rural communities. She will make a stop in Door County on Oct. 11 with a reading at Southern Door Community Auditorium. 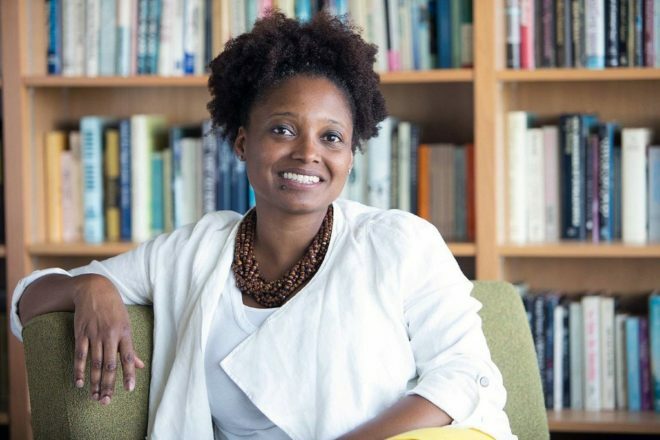 Smith will read work from her latest book of poetry, Wade in the Water, and from an anthology she edited titled American Journal: Fifty Poems for Our Time, published this September. Before her visit, I interviewed Smith from her home in New Jersey to talk about her latest work and her tour of America. Why focus on rural communities for your tour? Partly because most of the events that I tend to do as a writer are in cities and on university campuses and I feel like those are wonderful environments, but those aren’t the only ones and I was curious to see what questions and realizations poems might trigger in different places. I also was motivated by the feeling of dissatisfaction with the prevailing description of America as fundamentally divided across these kind of geographical or cultural lines. I wanted to test out this suspicion I had that people of different backgrounds from different places with different lifestyles actually do have things to say to each other and because poetry puts us in touch with some of our large questions, powerful memories and ongoing wishes, I thought poetry might be a really great connective tissue. Have you had a lot of really good dialogue come out of these tour stops? They’ve been really wonderful. I feel like poems are good at getting past small talk, that I can read a poem by Kevin Young about the birth of his son and suddenly I’m in a room with strangers on the tundra in Alaska talking about life and death and memory and loss and joy and fear and some people’s take on these things are very different from other people’s or my own and instead of being a barrier it represents an enriching of my own understanding of feelings I live with. It’s been really exciting to be in a conversation where we agree on some things or surprising each other with things or we disagree in productive ways. It feels like a really good model for the ways we ought to be talking with and listening to each other all the time. What’s the most remote place you’ve been to? You’ve been to Alaska for this tour? Yeah, that was one of the last stops we made. We visited Bethel, which is in the West and, I guess, gateway to the tundra, and the First Nation communities. We were also in Juneau, which is a big city in Alaskan terms but in that place instead of going to a big theater we read in a youth detention facility. There was a big event that night at the state library, but it was nice to dip into other places that were different from where I’m often finding myself reading. I also, outside of Anchorage, read at a retirement home for veterans and pioneer people who had been homesteaders decades ago and that was a really different way of talking of poetry and experiencing poems together because most of the people in that room were not verbal and so our engagement was different and that was a beautiful thing. Just thinking of different rural communities, I’m guessing there are demographic differences in the communities you’re visiting. Are your poems received differently in certain regions? I feel like every single audience is different. I haven’t come away from this project feeling like there is a difference between an urban and rural reading of a poem, but when I’m reading my own poems I’m tending to read from my new book [Wade in the Water]. There are a lot of poems about American history. There’s one poem that I tend to read an excerpt of just about every time I read which is rooted in the experience of black soldiers during the Civil War and I’ve read that in the South and the North and across the board it’s the poem that people have the most to say about. Sometimes it’s because they’re drawn into the private experience of the different speakers in the poem. Sometimes it’s because there’s a sense of living history of the Civil War in certain landscapes and so it feels like something that’s not as remote as it might feel to me in New Jersey. Which of your poems has the most impact when read aloud. Is it the one you were just speaking of? I actually can’t say. I know I read the poems the way I hear and feel the poems and I often find myself in a conversation with someone who said, “Oh, I got the poem in such a different way than I read it on the page,” but I don’t know. Maybe it’s the many different voices that make up the poem I was referring to [in the previous answer], it’s called “I Will Tell You the Truth about This, I Will Tell You All about It.” It’s a found poem so it’s not my language, but language from existing letters and court statements to know that those are the actual voices of people that are being gathered together in a kind of chorus, I think that does have an effect on people. To think this isn’t an act of the imagination, it’s history. That is something I find myself talking with people in the audience about after I’ve read that poem. Are you ever surprised by your own words when reading your poetry? Well I hear different things in them, especially if I’m reading poems that I haven’t read in a long time. I recognize different things that I don’t think I was aware of when I was writing them and that’s always exciting, to see that there’s something the poem itself or my own conscience was tapping into that my conscious self wasn’t aware of. That’s always exciting. And then it’s also just the fact of reading a poem in a different time period that it sometimes speaks to things that are current that the poem couldn’t have been mindful of when it was written but get activated by different things, gestures in it and I love that too. I think that can happen with all poems. Is there a lot of variation in the poems you choose to read? There has been because the Library of Congress trips where I’m going into communities … to read and talk about poetry, I’m reading mostly from an anthology I’ve edited, which has just come out called American Journal: Fifty Poems for Our Time. It’s 50 different poems by 50 contemporary American poets. I tend not to plan what I’m going to read, but say, “Everybody, here’s a copy of this book, let’s look at the poem on page 45 and see what we hear,” and then the conversations and the things that come up make me think this other poem might be interesting to read after that. So in a way I’m trying to listen to what takes shape in the room and respond to that. I guess I do that a little bit when I’m reading my own work too, but what’s been exciting about the trips I’ve taken as poet laureate is that they mostly haven’t been about me and my own work but rather about poetry in many different voices. When I read Wade in the Water – especially the treatment of history – and I think of our current political climate, a question that comes to the top of my mind is, how many different versions of America are there? Why juxtapose historical texts/source materials with current affairs in this book? I wanted to see if history could speak to the various conundrums of the present in a way that we haven’t yet allowed it to. When I found the voices from the Civil War I felt astonished by how current they felt. They didn’t feel 150 years old to me, they felt brand new. I could hear them as though they were spoken today: “I need help.” “I don’t feel like I’m being treated fairly.” “I gave this service, I was promised this, but that promise hasn’t been made good on.” It felt like the kind of question that hasn’t gone away for many people and I got excited thinking there must be more that history can say; there must be more that we can hear. So, to me, the heart of the book is looking backward and an attempt to hear something that could be useful to the present. And then there are the poems that come out of the present and I hope that they resonate differently after the experience of these historical voices. So a poem like “The United States Welcomes You,” if you read it right after a poem that is by all these voices – Americans who served in the armed forces, who were enslaved and fought for freedom – and the way that the subject in the present-day poem is being integrated and inspected, I hope your feeling of protection for the speaker from the Civil War carries over into the way you might hear what it would feel like to be addressed in a such a way today. I hope that these different time periods can have a conversation with each other to animate that sense that you just described that there are many different Americas within this one place and they’re all urgent. I was taken aback by the poem “Declaration.” Where did that come from? How did you think of that? Well I was just reading the Declaration of Independence because I had all these historic documents that I was working from. I was trying to write a poem that I had started and finished but had been dissatisfied with that was about Thomas Jefferson, so I thought, let me just look at the Declaration of Independence to see if this could help me. Then I started reading the document and I heard these statements and they are all pointed at King George, I guess, and England, and yet if you take away the specifics of space and time, I began to hear a story of the black experience in this country both historically and in many cases now. It was overwhelming to me and my little project to write about Thomas Jefferson fell to the wayside and I said I’m just going to write what I hear. I’m going to allow these fragments of this founding document to say this other thing that they seem very intent upon saying to me now as I sit here reading. I think Wade in the Water ends in a hopeful note with “An Old Story.” What do you see as the hope for America’s future? That poem was a wishful poem. That poem was a myth, something that points forward, and it’s a myth that’s rooted in love. That’s the big work that a lot of the poems are trying to do, if you don’t want to call it love, then maybe you can call it compassion. There’s so much that has to do with race in this book and the last word of that last poem is “color” – “We wept to be reminded of such color.” To me, that’s not about birds and animals climbing down from trees, that’s about saying, “Look at you. You’re different from me, how beautiful you are,” and that’s the hope at the end of that book. Let’s find a way to love each other. What could come from that if we were able to do that? I’m working on an opera libretto with a composer called Gregory Spears. We’ve been commissioned to write an opera for the Cincinnati Opera that’ll premiere in 2020 and we’re well into that. And I’m working on co-translating a contemporary chinese poet named Yi Lei, so those are the two projects that I find I’m able to do amid all this other stuff. I hope I’ll get back to writing poems at some point and also I’d like to reflect on these two years as poet laureate in a little bit of prose probably. Is opera new territory for you? It is. I’ve written one other libretto and I’m really excited to see how the medium is capable of drawing upon the mythic areas of real life and it’s a great vehicle of thinking about how the voice and sense of private narrative can be transmitted through words and music. I love how contemporary opera draws upon so many different traditions, many of them musical and operatic, but also film and visual art, and I’m excited about how poetry relates to those other art forms as well. It’s also new enough still, so it’s not easy, which I like.